I just recently got into Garth Brooks. What took so long I have no clue but it’s been fun learning about him and his songs. I love this part of “discovering” a new artist, when there are so many album tracks and deep cuts to hear and learn. It’s like a spiritual awakening and THE Garth Brooks definitely has not disappointed. 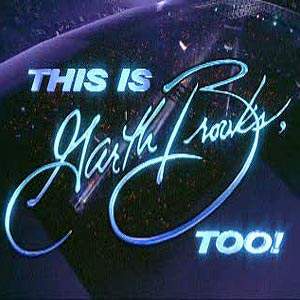 I watched the This is Garth Brooks live special, his first one ever. I liked the selection of songs because the setlist obviously relied heavily on his first two albums (which I love). You get a glimpse of where Garth was at the time and where he was going. Then I watched his second live special This is Garth Brooks, Too. This was filmed in 1993 at the height of it all. I’m not referring to just Garth’s career because he can still sell out multiple shows in one city in a few hours. No, this was the height of everything…from CD sales, 90s country, and the still relatively new highs of Garth’s career. Unfortunately, I can’t personally relate to this time period in country music. Around the time this special was filmed I was only about 13 or 14 and I wouldn’t attend my first concert for another 2 years, which was not a country show. My first concert was Def Leppard in 1996, where grunge dominated the rock genre, causing hard rock bands to downscale their live show productions. In fact, Garth performs in the round with tons of lights, fire, water, etc. In their late 80s heyday, Def Leppard put on similarly spectacular shows! Needless to say, I missed the boat more than once: the rock era and 90s country music! While I can’t relate to this magnificent show and this era of country music, although more than anything I wish I could, I still got goosebumps while watching this entire show. What a time to have been a country fan! I definitely would have caught Garth Brooks live when he came to town. He entertains audiences so naturally from every aspect of the show. The first Garth show had snippets of pre-recorded commentary from himself and his band, and in one of them he stated that before every show he sits in the farther seats possible to see the view. While he performs he tries to remember the person sitting in that seat and thinks of ways to make that person feel special. It shows. Garth was suspended above the crowds via cables! What the hell?! What a fun concert to watch on DVD and I’m sure it was even better live. Anyone who saw Garth in those days sure is lucky! However, just as much fun this show was, I felt a sense of sadness wash over me. How did country music come to what it is today? The result of the process of evolution is astonishing, from audience expectations to songwriting to song production to the value of an album and artist integrity. Most of the time ALL of that is chipped away, leaving so many empty, throwaway songs and artists. Perhaps that topic would be better to discuss in another article. But I can still pop in my DVDs of old Garth Brooks concert specials and sit in awe of the spectacle he creates wherever he goes.